Canadian militarism has long been associated with the poppy, but that association is taking on new meaning amid reports that Afghan opium production has reached record levels under NATO's watch. What's more, the report notes that production has decreased in northern and central Afghanistan—where there is widespread poverty—and is surging in southern and eastern Afghanistan, where Canadians are stationed. This fact alone should be worrying enough to Canadians familiar with the long-established history of intelligence agencies' implicit support of the opium trade through operations like Air America. As Alfred McCoy, a professor of SE Asian history at the University of Wisconsin-Madison reveals in his book The Politics of Heroin: CIA Complicity in the Global Drug Trade, "Afghanistan opium production increased from 100 tons in '71 to 2,000 tons in '91 due to CIA support of the Mujahedeen and increased in 2001 after the fall of the Taliban to 4,600 tons." (p.15-16). 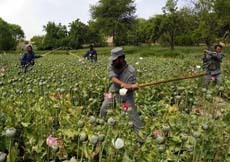 At the very least, Canada cannot claim that the boom in opium production—which hit 8,200 tonnes this year—was an unexpected result of plunging the country into chaos and installing a puppet president who just happened to consult for UNOCAL, a company which just happened to spend a great deal of effort in the 1990's lobbying the Taliban to allow construction of a pipeline through Afghanistan to carry natural gas from Turkmenistan to Pakistan. This chain of connection is not trivial. In fact, it goes right to the heart of why Canadian soldiers are fighting and dying in Afghanistan as we speak. Despite initial fuzzy reports that the war was about rooting out al Qaeda—which they didn't do when they had the chance—or bringing freedom to women in an oppressive fundamentalist regime—which neglects to mention that one of the West's closest allies in the region is, if anything more oppressive—the war and current "reconstruction" effort which our men are dying for actually turns out to be about—you guessed it—oil. Or maybe it was just a coincidence that the Afghan attack plans were on Bush's desk two days before 9/11. At any rate, the invasion evidently wasn't intended to end the opium trade, or produce higher standards of living for the farmers driven to growing poppies as the only viable way of making a living. Harper, for his part, hasn't had much to say recently about what we're doing there anyway.